Last weekend we spent the whole day in the backyard, planting, cleaning, weeding. And result was empty fridge with half head of red cabbage, few potatoes, chilies and cilantro. That was it. I really did not have energy to go for going grocery shopping. I wanted to make these cutlets. It is one delicious recipe of cutlets. I have made it various times in the past. But today I needed something filling for dinner. So I decided to make stuffing using similar combination for stuffed paratha. The result was amazing. It was one healthy and satisfying meal. And most importantly, everything was done in 30 minutes!!! Its a keeper recipe. Mix everything except water. Knead together using little water at a time. Dough should be like chapati dough. Set it aside for at least 15-20 minutes. Microwave potato and peel. Mash it and keep aside. Remove the core of the cabbage and chop it into big pieces. Add these pieces in a food processor. Add green chilies and salt. Pulse it to shred. Set it aside for at least 15 minutes. Squeeze shredded cabbage to remove as much water as you can. This water can be used for soups or rice. Now add mashed potato to the cabbage and mix well. Stuffing is ready. Heat tava on medium heat. Make about 8-9 golf ball sized balls of the stuffing. Make 8-9 balls of dough. Using bit of flour, make a cup out of dough. Put the stuffing in that cup and close it slowly sealing the stuffing. Lightly roll the paratha lightly flouring it if needed. Make the paratha as think as you prefer. Make sure the stuffing doesn't come out while you are rolling. Transfer it to hot tava and cook both the sides properly. Use little oil to roast the paratha if you wish. Serve warm with either with chutney, koshimbeer or pickle. I normally prepare Cabbage Parathas by mixing with the dough, but liked your version of stuffing it along with Potatoes. ...ase parathe aadhoon-madhoon milale tari chaalteel. 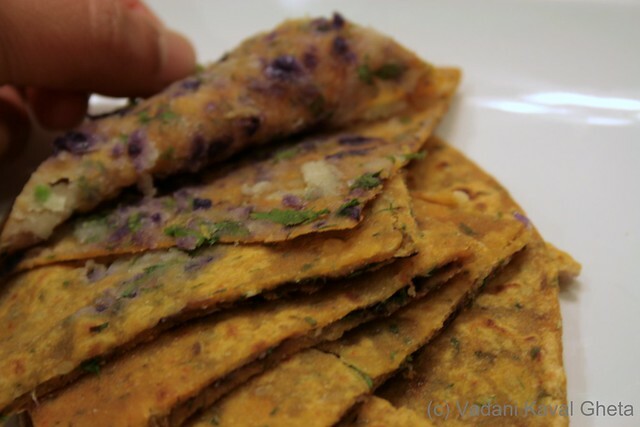 I love making all kinds of stuffed parathas, and although I've made aloo paratha and cabbage parathas, I don't think I've ever tried making a stuffing of the two together. Great idea! I absolutely agree on those cutlets, and the parathas look like a great adaptation! I think your bean cutlets and cooker's cabbage-sesame baked cutlets are the only types I have made using recipes. S, TC - May your wishes come true. Hey Mints, just posted your methichi bhaji on my blog-- we loved it. Thanks for a delicious recipe! Btw, I love your blog -- I grew up eating a lot of these dishes! Thank you Sadhana. I will follow up with them.